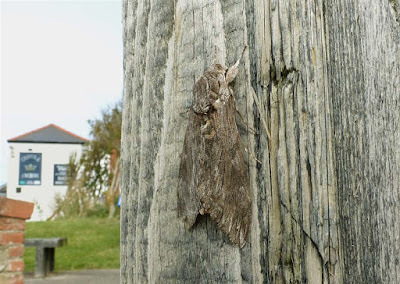 69.004 Covolvulous Hawkmoth, resting on a post outside the Crown and Anchor pub at Spurn, Sept.9th 2015. Not exactly inside Calderdale but I couldn't resist posting this one. Same moth as above after someone had tried unsuccessfully to relocate it to a "safer" area. It just became agitated and flew around wildly before returning to the same area - at least it gave me the opportunity to photograph its striking abdomen. 69.001 Lime Hawkmoth larva, Calderdale Hospital boundary wall, Sept.9th 09. Collected by day. 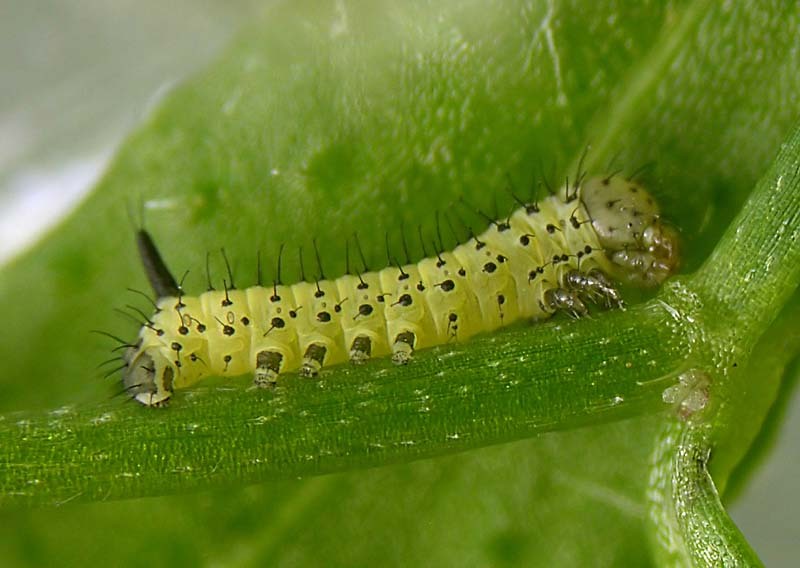 Four records of single larvae on the roadside area of this site over two years suggests a reasonably healthy population exists amongst the numerous limes present. 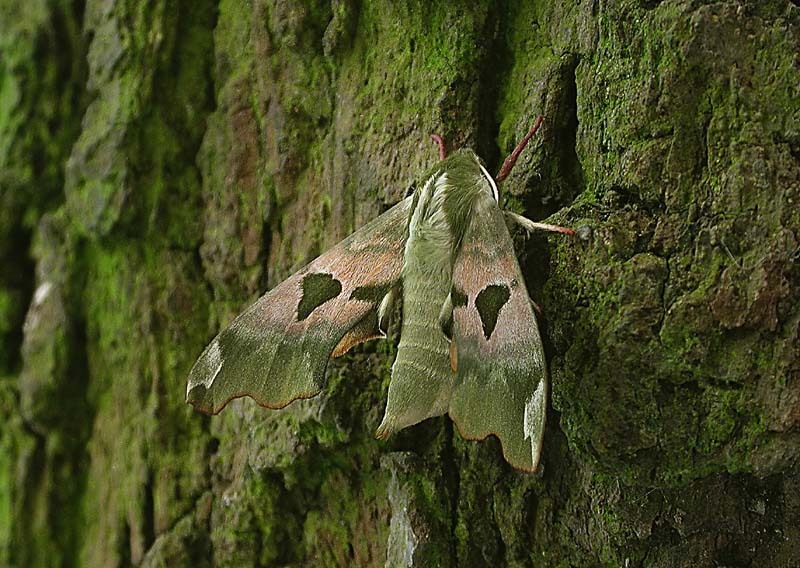 Also two adults were seen in the same area in the spring of 2014, both resting on walls and probably having just emerged. One was of the orange red form brunnea. 69.001 Lime Hawkmoth (male), Apr.17th 2010. Reared from the larva above. 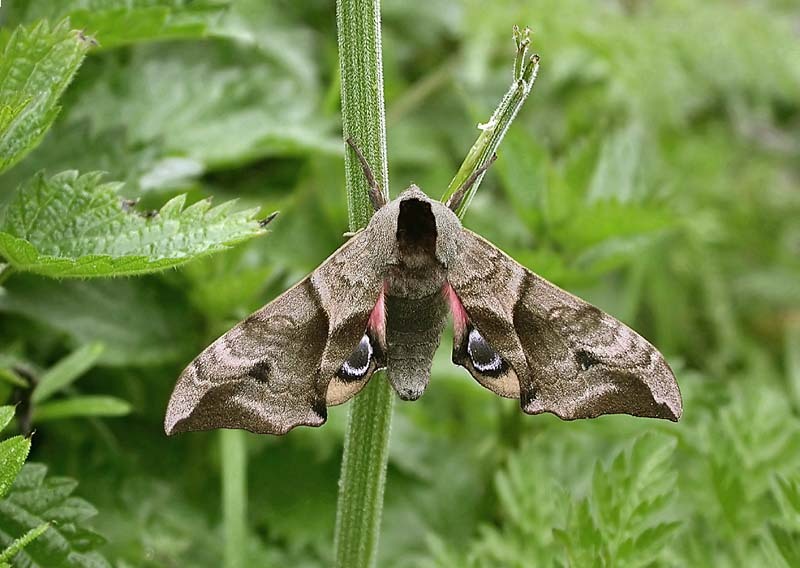 69.002 Eyed Hawkmoth (male), the towpath at Elland Bridge, May 16th 07. A daytime observation. My only other record is of a pristine male found in a greenhouse at Skircoat Green allotments on May 16th 2012. It was found by a plot holder in her greenhouse. 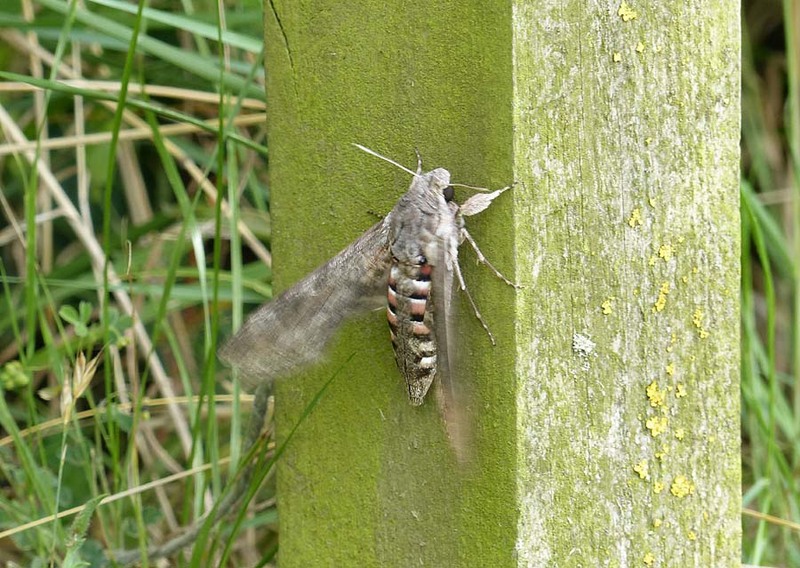 A scarcely recorded species in Calderdale. 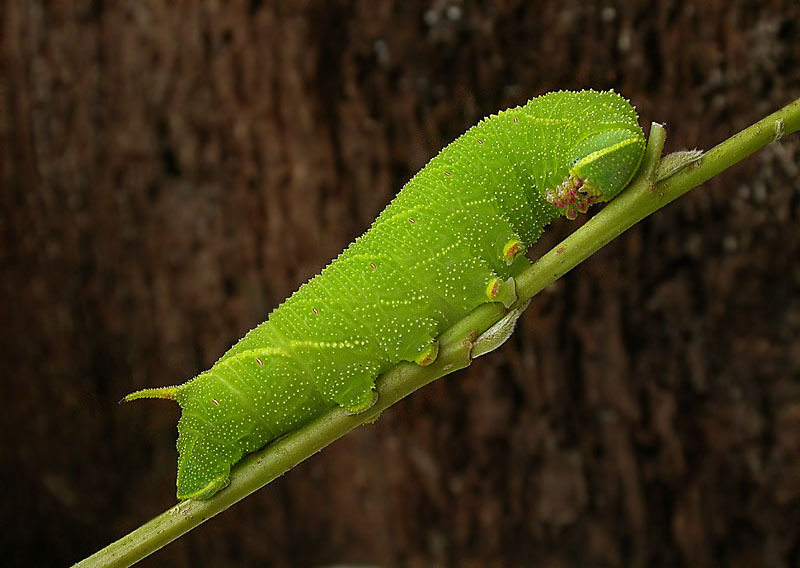 69.003 Poplar Hawkmoth larva, Tag Loop, Sept.15th 2012. Found crossing a path after apparently being blown out of a nearby Crack Willow tree. 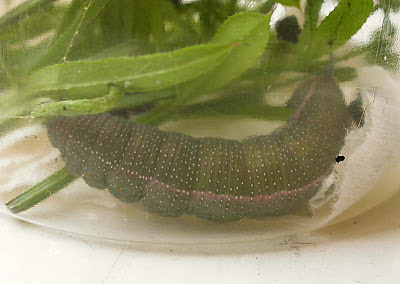 To rear the larva through I placed it in a plastic container which in this case was an old, clear, 500ml yogurt. Obviously you need to ID the larva and find out what it will eat. Provide fresh leaves and remove frass daily. Once it’s fully fed it will become very restless as it searches for somewhere to pupate. Now’s the time to transfer it to a largish plant pot two thirds full of slightly moist potting compost. Put some leaves in just in case it’s still hungry and cover the top with a nylon secured with an elastic band. An old pair of tights will suffice. 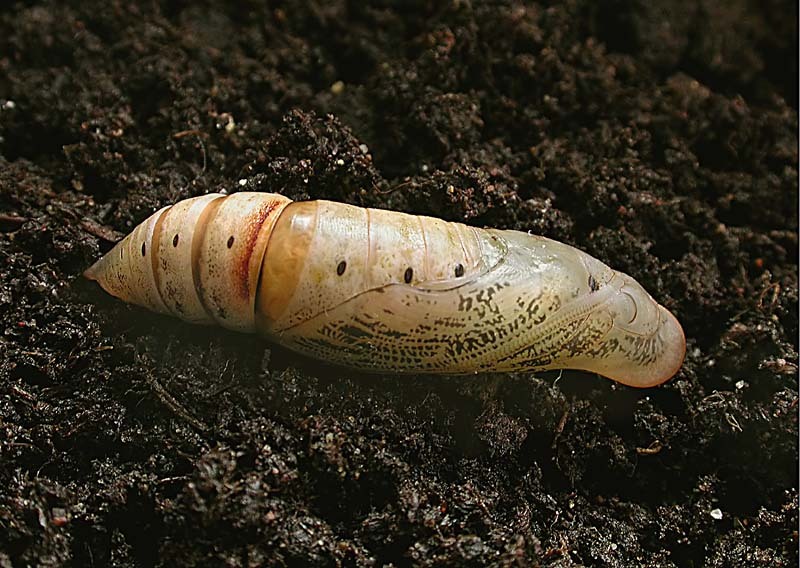 If it’s ready to pupate it will quickly burrow down in the compost. 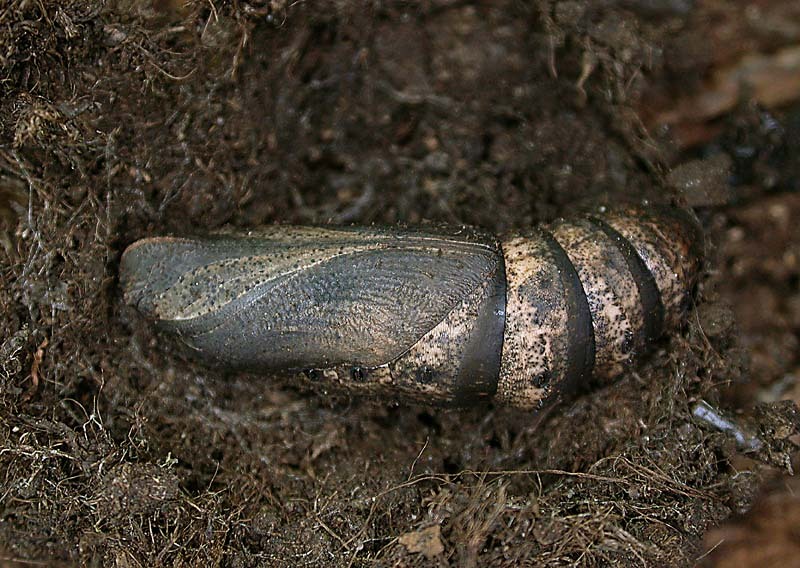 After around three weeks the pupal case will have hardened sufficiently to allow safe removal from the plant pot, I carefully excavate it with an artist’s paintbrush bearing in mind that the pupa will probably be inside a flimsy outer cocoon constructed from silk and particles of compost affording it excellent camouflage. Next place it on some kitchen roll inside a large Tupperware box. The box then goes in a shaded outhouse for the winter. Just before closing the lid, gently breath on part of it to add a tiny amount of moisture and then quickly snap it on. Every two weeks or so throughout the winter repeat this process to let fresh air in and also to replenish the moisture. If the box smells when opened the pupa will have died and gone soft and mouldy but fingers crossed this has never happened to any of mine. 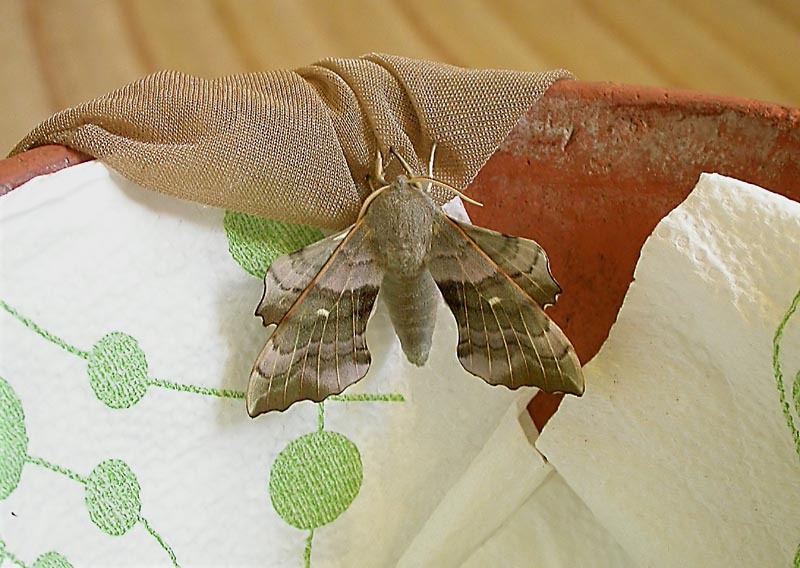 Come next April bring the pupa indoors and place it a container lined with kitchen roll, the original plant pot will do. Lightly spray the pupa every morning with water using a gardener's mist gun and again keep the pot covered with nylon a week or so before emergence is due, it usually takes mine about a month after bringing it indoors. The kitchen roll aids the moth to gain a foothold to let it's wings expand or at least it enables it to climb up to the nylon to do so. Below is the freshly emerged moth still clinging to the nylon that covered the pot. 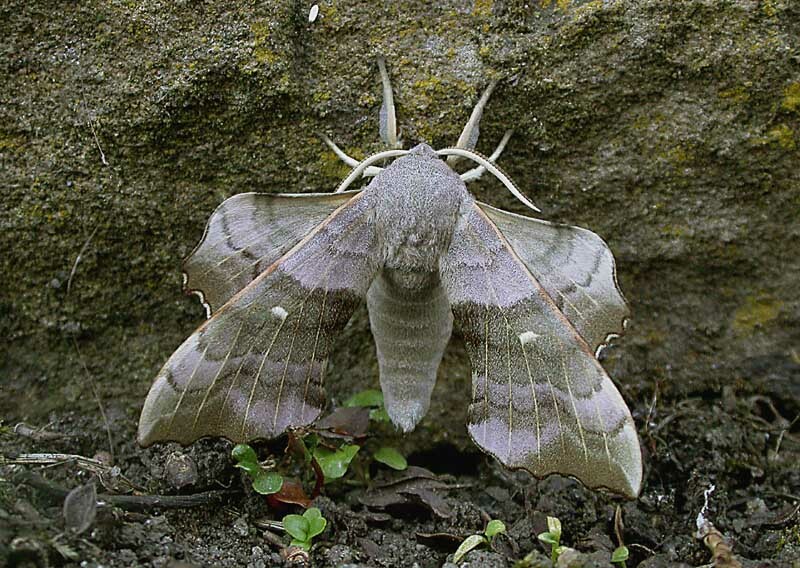 69.003 Poplar Hawkmoth, May 7th 2013. 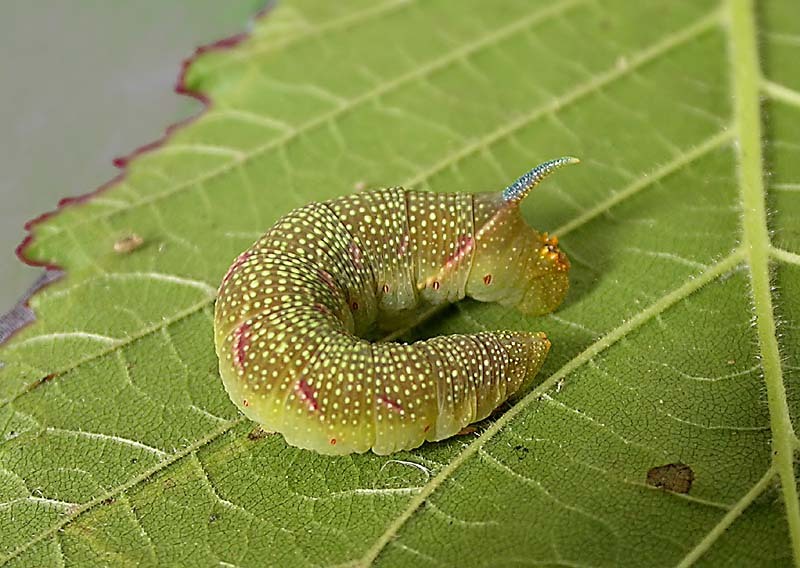 Reared from the larva illustrated above. A pristine male with not a scale out of place. 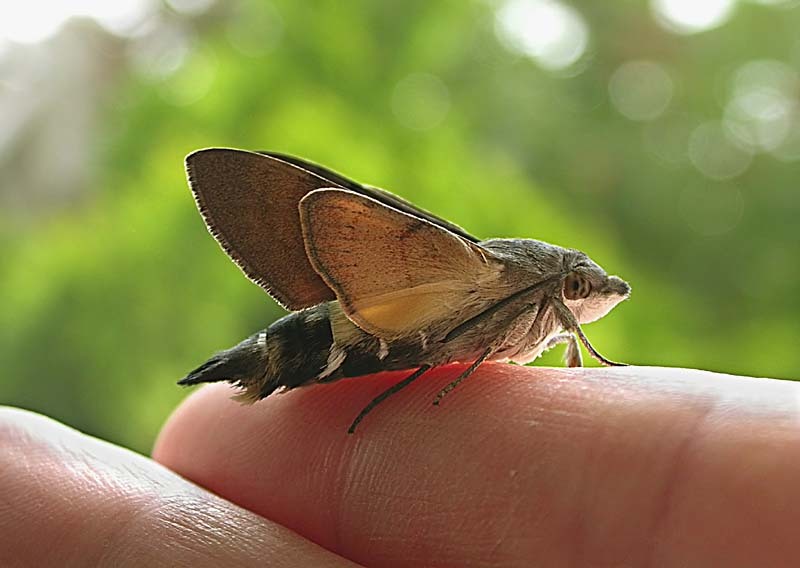 69.003 Poplar Hawkmoth, May 7th 2013. Details as above. 69.010 Hummingbird Hawkmoth laying eggs in the garden, July 2nd 2011. You can just make out her abdomen curling underneath the Common Cleaver (Galium aparine) leaves as she deposits her eggs. 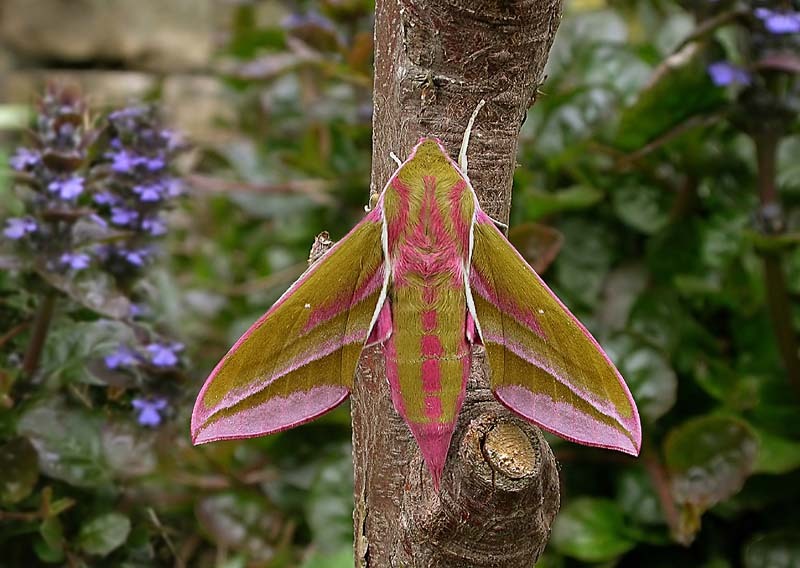 My fifth record for the garden and 7th from within Calderdale. 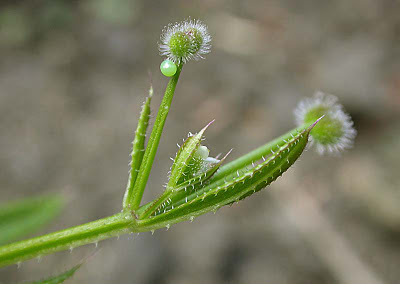 69.010 Hummingbird Hawkmoth egg on Common Cleavers. Using the above photo as a guide two eggs were soon found. 69.010 Hummingbird Hawkmoth egg, July 5th 2011. Three days later and the eggs are ready for hatching as they develop darker, cloudy patches. 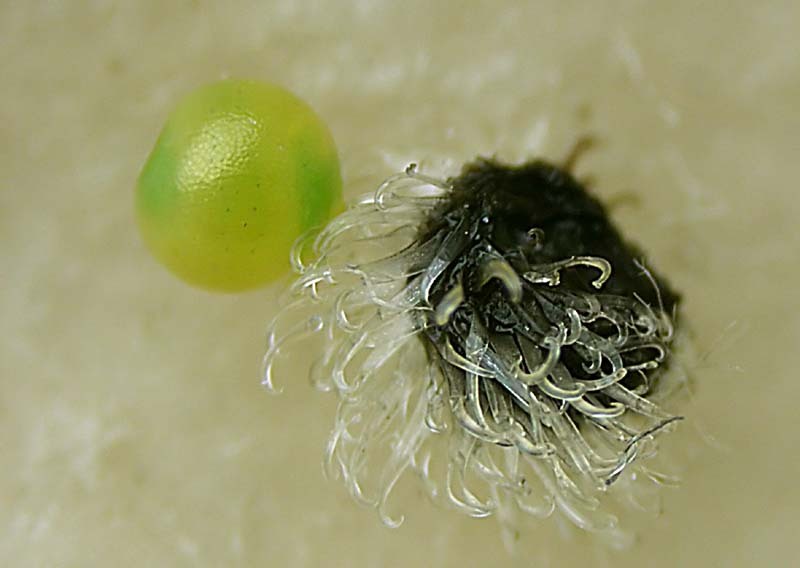 This and the photo below were taken through the 20x eyepiece of a microscope. 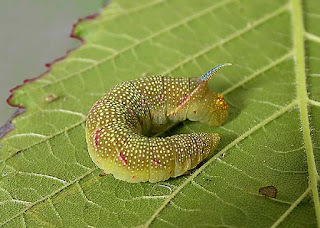 69.010 Hummingbird Hawkmoth newly hatched larva at 2mm long. Just 4 days after being laid the first egg hatches. Straight away the characteristic hawkmoth horn on the rear end is present. 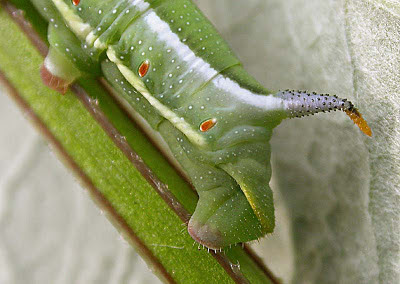 69.010 Hummingbird Hawkmoth 3rd instar larva at 12mm long, July 14th 2011. 69.010 Hummingbird Hawkmoth, detail of the horn during the 4th instar, July 19th 2011. 69.010 Hummingbird Hawkmoth pre-pupal larva, July 23rd 2011. The larvae have finished feeding and turned a dull pink and brown. They will soon begin to spin their cocoons to pupate in. 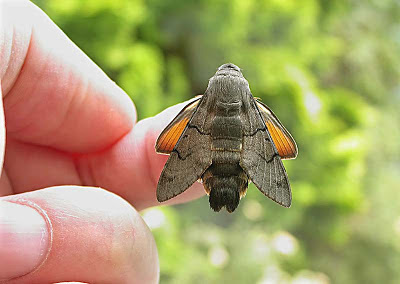 69.010 Hummingbird Hawkmoth pupa extracted from it's earthen cocoon, July 30th 2011. 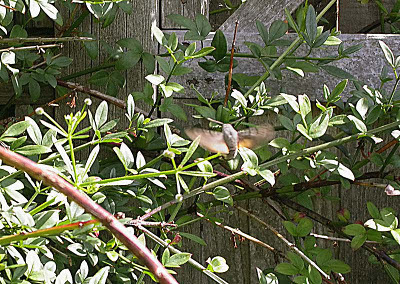 69.010 Hummingbird Hawkmoth, Aug.18th 2011. 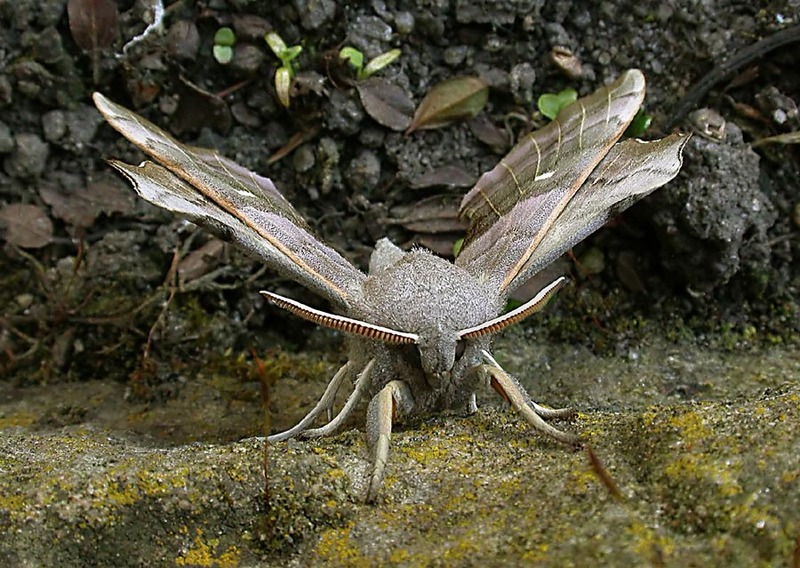 It's just 47 days after the eggs were laid and already both adults have emerged. 69.010 Hummingbird Hawkmoth, same adult as above. From eating machine to flying machine in 27 days! 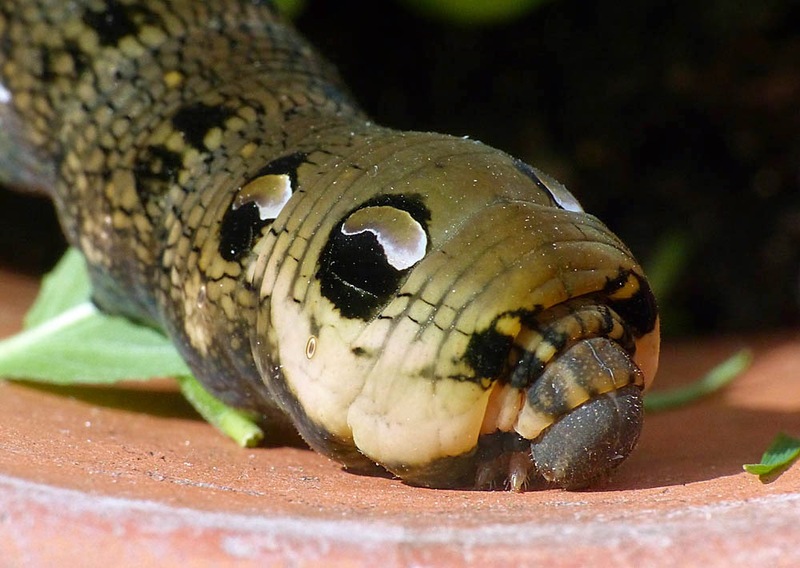 69.016 Elephant Hawkmoth larva in the garden, July 26th 2014. 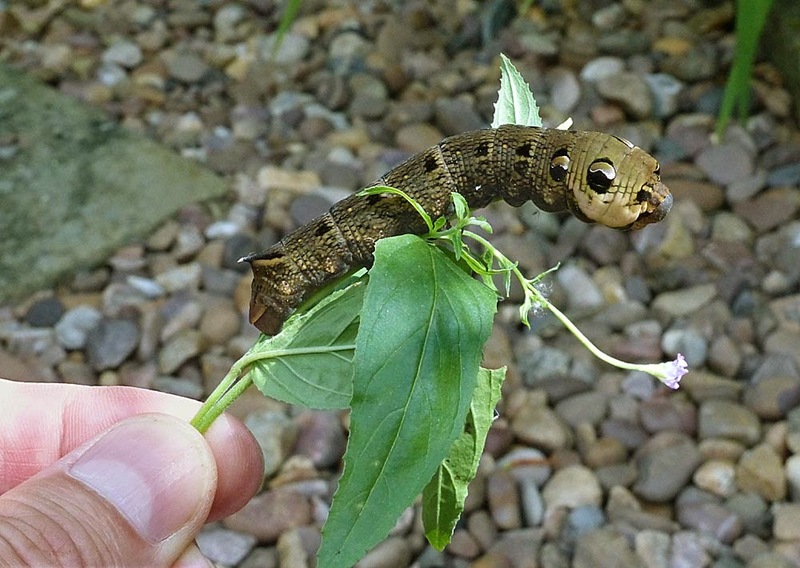 Found by my mother after weeding some small willowherbs. She considered the possibility that it may have been a small snake! 69.016 Elephant Hawkmoth, same larva as above. The tiny, grey head and forelegs are easy to miss. 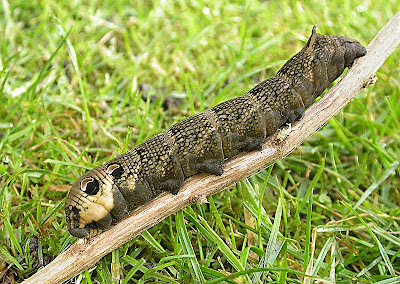 69.016 Elephant Hawkmoth larva, Fall Lane, Sowerby Bridge, Sept.21st 2010. Collected by day on Rosebay Willowherb. 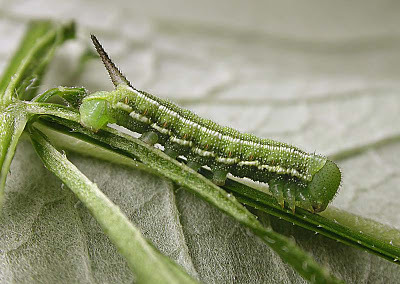 Larvae can be very conspicuous as they rest openly by day on their foodplant in August and September. 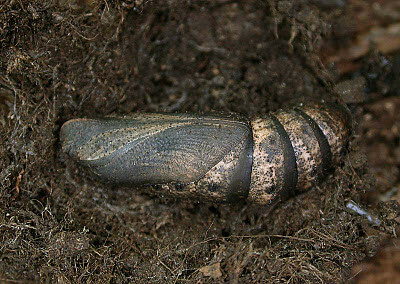 69.016 Elephant Hawkmoth pupa, Oct.3rd 2010. Reared from the larva above. It will spend the winter in an outbuilding and be brought in next March. 69.016 Elephant Hawkmoth, Apr.26th 2011. Reared from the pupa above.